No one can deny that it is great for children to have pets, A cat or dog can help them to understand and respect animals. However, things can get tricky when your beloved family pet gets fleas. Conventional flea treatments involve strong toxic chemicals that can be highly dangerous to young children and the last thing you want is your toddler stroking your cat right after an application of frontline! So what can be done? Well, there are a number of natural remedies that work to deter fleas from your pets and the best thing about these is they are completely safe for all members of the family. One of the most popular of these remedies is apple cider vinegar, a fermented liquid with a plethora of powerful healing properties. How does ACV work for fleas? 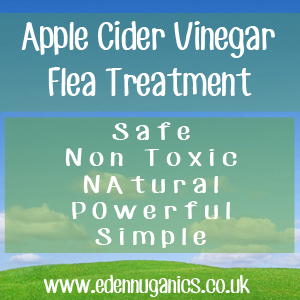 Apple cider vinegar contains a number of naturally occurring acids that fleas hate. In fact, they dislike apple cider vinegar to such an extent that even adding it to your pets food or water could be enough to stop them feasting on your helpless fury friend. As well as powerful acids, ACV has antibacterial and anti-fungal properties that may also help reduce the danger of infection from bug and insect bites. First we need to make a 1 part water to 3 parts ACV mixture and give this a stir. The next step is to add our mixture to a spray bottle. A house plant mister (or missus) seems to work great for this job. Stand around 6 inches from your pet and cover with a fine mist making sure to avoid eyes and face. This can be repeated twice a day until your pet is flea free. Sometimes a more serious approach must be taken when treating your pet. In this treatment we are looking to apply a 50-50 solution of apple cider vinegar and water. Using a damp cloth, apply the mixture to your pet's skin. This must be done by slowly pulling back areas of fur before applying the ACV to the skin. This should only be done once every two days as ACV may aggravate your pet's skin over time. Salt - Yes, you read that correctly. Salt can be used with great effect in the treatment of fleas in your home. Salting and vacuuming your floors and furniture kills flea eggs by dehydrating them. Essential oils - Although essential oils only work as a repellent and will not actually kill fleas, they can be used in combination with other natural products to make highly effective formulas. Some of the best essential oils to use are eucalyptus, lemon, lavender, tea tree and clove. Kill source of fleas by salting carpets and furniture. Vacuum regularly to remove fleas and flea eggs from household. Apple cider vinegar spray for your pets and home. Use flea comb to comb out pets. Use repellents, including essential oil collars and sprays on your pets. It's so easy and you can start right now!